If God is so purposeful in adorning the flowers of the field, then he will certainly provide clothing for us. If he provides for flowers that are short lived, then he will provide for us, who are eternal. 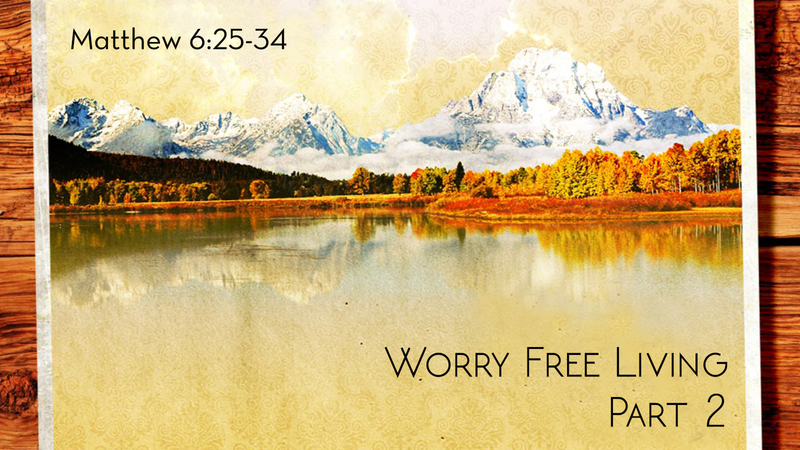 Jesus pointed out the root of our problem with anxiety and worry. It is our little faith. The antidote for a worry filled life is faith filled living. The Sermon on the Mount is spoken to people of faith. Jesus provides for people of faith a life free of anxiety and worry. However, when we have “little faith” we are susceptible to anxiety. Therefore, we must aim for great faith and be totally dissatisfied with little faith. People of little faith don’t experience the fullness of God’s promises; they’re too worried about the basics to have faith in the abundance of God. Great faith is non-selective faith, believing all the promises of God. Do you believe Jesus? Believing him is to confess his word, to live it and to apply it to our daily living. That is great faith. Christians should master life’s concerns with faith or the concerns will master them. Faith is never void of thought, in fact, faith is immersed in thought. Jesus said to look at the birds, consider the lilies and think about the grass. People of little faith do not control their own thoughts. If we lie awake at night or find ourselves thinking about the same circumstances throughout the day, then we’re spinning in circles, like a dog chasing his tail, desperate for what is already ours. Faith is as essential to living saved as it is to being saved. Salvation is not just a future hope in eternity; it is also living the expression of hope today as a favored child of God. We must see ourselves as children of God; this is a key to worry-free living. Faith is the application of living fully as a child of God.